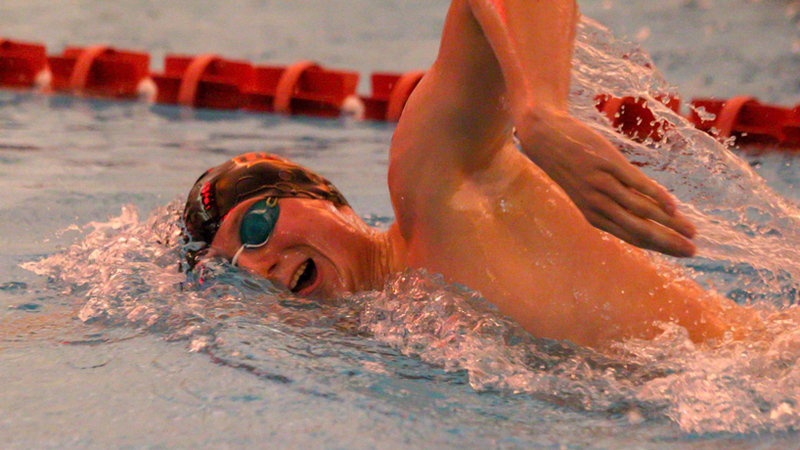 Junior Patryk Golinski bettered his own school record while swimming to a third-place finish in the 400-yard individual medley at the Great Lakes Valley Conference Championships. It was one of 12 school records Tritons swimmers set over three days of competition in Crawfordsville, Indiana. The Triton swimming teams combined to break 12 school records at the Great Lakes Valley Conference Championships in Crawfordsville, Indiana. The men posted a program-best fifth-place finish out of 10 teams, while the women were seventh out of nine teams. Junior Patryk Golinski swam to a third-place finish in the 400-yard individual medley, breaking his own school record in a time of 3 minutes 57.27 seconds. Golinski also broke the record in the 1,000-yard freestyle and helped the 200- and 400-yard freestyle relays to records. On the women’s side, junior Amber Visser broke individual records in the 100- and 200-yard breaststrokes and the 100-yard butterfly and helped the 400- and 800-yard freestyle relays and the 400-yard individual medley relays to records. Her top finishes were fourth place in the 100-yard breaststroke and fifth place in the 200-yard breaststroke. UMSL ran past Missouri S&T 76-63 Thursday night on the road for its sixth straight victory, but the streak came to an end Saturday with an 84-68 loss at Drury. Senior Johnathan Matthews averaged 15.5 points and 3.0 assists, while senior Eric Dust averaged 14.0 points and shot 63.6 percent from the field. Coach Bob Sundvold’s team (18-5, 9-4 GLVC) is at Lewis and Indianapolis on Thursday and Saturday, respectively. The Tritons suffered road losses to Missouri S&T 60-49 and top-ranked Drury 77-44 last weekend. Sophomore Alex LaPorta averaged 12.0 points, 8.5 rebounds and 2.5 steals. UMSL (11-11, 5-8 GLVC) is at Lewis and Indianapolis on Thursday and Saturday, respectively. UMSL went 0-6 at the Charger Chillout to open the season. Senior Lizzy Miller recorded team-highs of six hits and three RBIs. The Tritons will play six games in the UAM 9-State Classic this weekend in Bentonville, Arkansas.